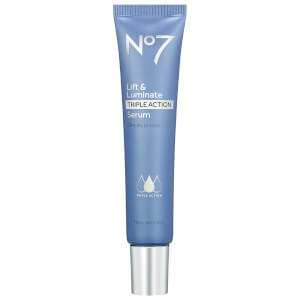 Target signs of aging with the Boots No.7 Lift and Luminate Eye Cream; a multitasking formula that delivers an array of benefits. Enriched with an intelligent blend of anti-aging and skin-lightening ingredients, the luxurious eye cream works to reduce the appearance of fine lines, wrinkles and stubborn crow’s feet, whilst visibly evening skin tone to reduce hyperpigmentation. 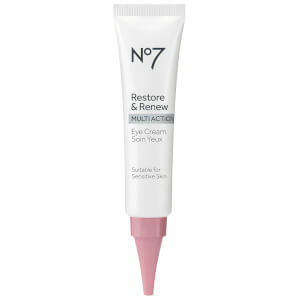 The potent formula also combats loss of elasticity to leave the eye contour visibly smooth, supple and firm. Harnessing the protective powers of SPF15 and antioxidant technologies, the Lift and Luminate Eye Cream guarantees advanced protection from the aging effects of both the sun and the environment. The cream effortlessly smoothes over the eye contour and is suitable for all skin types, including those with sensitive skin. Use morning and evening. Dot around eyes. Gently blend around their contours. Aqua (Water), Glycerin, Cyclopentasiloxane, Butyrospermum Parkii (Shea) Butter, Cyclohexasiloxane, Cetearyl Alcohol, Butylene Glycol, Polyacrylamide, Glyceryl Stearate, Stearic Acid, Palmitic Acid, PEG-100 Stearate, Phenoxyethanol, Dipalmitoyl Hydroxyproline, C13-14 Isoparaffin, Actinidia Chinensis (Kiwi) Fruit Water, Ascorbyl Glucoside, Methylparaben, Propylene Glycol, Laureth-7, Ethylparaben, Alcohol, Potassium Hydroxide, Retinyl Palmitate, Tetrasodium EDTA, Hesperidin Methyl Chalcone, Lupinus Albus Seed Extract, Steareth-20, Carbomer, Panax Ginseng Root Extract, Sophora Angustifolia Root Extract, Polysorbate 20, Morus Alba Leaf Extract, Ascorbic Acid, Ethylhexylglycerin, Chlorhexidine Digluconate, Tocopherol, Potassium Sorbate, Dipeptide-2, Palmitoyl Tetrapeptide-7, Palmitoyl Tripeptide-1, CI 77891 (Titanium Dioxide).